1st Brendan Gaffney, Tish Perry, Paul Connolly & Ted Hester. Sun 31st – Ross Andrew’s Captain’s Prize. The club wishes Ross every success for his weekend. Outstanding quarter final matches in the King Harmon Cup are to be play by this Saturday 30th July. The final remaining interclub competition on our gents calendar is the Connacht Shield which is scheduled for Tuesday 2nd August away to Ballaghaderreen. Those who wish to make themselves available for selection should write their name on the relevant sheet on the club noticeboard or contact team captain Brendan Gaffney. Free golf lessons for junior members continues every Saturday morning from 11am to 1pm. 3rd Lorcan Egan, Cillian Doyle, Michael Reid 81pts. Ladies: Joyce Boles, Mary O’Hara, Annette Bartlett 72pts. Thanks to all who came out to play to ensure this was a well supported event. It represents a token of our appreciation to all those local businesses who provided sponsorship to our recent open week. Thursday 14th July – 12 Hole S/ford. 1st Gerry Carty, Michael Gilmartin, Seamus Gallagher, Mervyn Boles. A reminder that quarter final matches of the King Harmon Cup are to be played by Saturday 30th July. Well done to Jonathan Egan who is the first player through to the semi-finals. Junior golf continues every Saturday Morning from 11am to 1pm for junior members. Membership enquires can be made to Michael Gilmartin on 0862039182. Ladies 9 Hole Stroke: 1st Tish Perry 35; 2nd Peggy Feely 37; 3rd Claire Cryan 38.5. Ladies Gala 18 Hole Stableford: 1st Regina McLoughlin 37pts; 2nd Brid Connellan (Strokestown) 37pts; Gross Betty Scanlon (Tubbercurry); 3rd Peggy Feely 32 pts; 4th Christine Hannon (Tubbercurry). 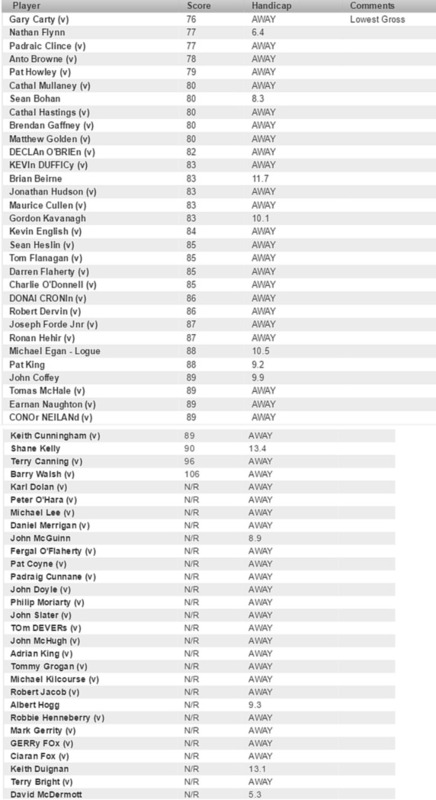 Men’s 9 Hole Stableford: 1st Ross Andrew 23pts; 2nd Lorcan Egan 23pts; 3rd Terry Canning 21pts; Visitor: Colm Connolly 21pts. 18 Hole Scotch Mixed Foursomes: 1st Ross Andrew & Claire Cryan 63.5; 2nd John McGuinn & Peggy Feely 65; 3rd Michael Rush & Sandra McCrann 65. Men’s 9 Hole Stableford: 1st Eamon O’Loughlin 21pts; 2nd Cillian Doyle 20pts; 3rd Michael Simon 19pts. Ladies 9 Hole Stableford: 1st Ruth Hogg 16pts; 2nd Moira Egan 16pts; 3rd Sandra McCrann 14pts. Competitions were cancelled due to heavy rainfall. Presentation of Prizes for competitions (Thurs-Sat) will take place this Thursday Evening in the clubhouse at 9pm. Prizewinners are requested to attend. Open week’s raffle will also be held on the night. Thanks to all the businesses and individuals who supported our Open Week. And also a mention to the organising committee and to anyone who contributed to its success in any way. The club wishes to thank you all. Saturday & Sunday – Boyle Business Association. Format: 3 Ball Waltz Rumble. Cost: €30 per team. The Junior cup team competed in the north zone qualifier in Carrick on Shannon last Saturday. The team were unfortunate not to reach Sunday’s matchplay stage missing the cut of 333 by just 6 shots. The King Harmon has reached the last 8 competitors. Quarter final matches are to be played by July 30th. Free Golf Lessons for junior members continues every Saturday morning from 11am-1pm. The Club extends sympathy to Mary O’Hara and Family on the passing of Mary’s mother Maura McGing, Westport. Remains reposing at Nevins Funeral Home, Westport today Wednesday 5.30/7.30. Funeral tomorrow, Thursday, at 12.00 in St Patrick’s Church, Aughagower, Westport. May she Rest in Peace. The Fore Club Alliance competition took place last weekend. Forty points proved to the mark required to feature in the top three. The best of the 40’s came from Pat Brogan who edged out Jonathan Egan and David Wynne on the countback who were second and third respectively. The gross prize went to six handicapper Aidan Grealish from Strokestown. The men’s 12 hole open competition on Thursday was won by Owen Garvin 28pts. In second place was Colm Connolly also on 28pts. Friday’s Scramble was won by the team of Charlie O Donnell, Tommy King & Marian Ahern. Our annual Open Week gets underway today with a nine hole stroke for ladies & gents. Tuesday is Ladies Day with the competition being an 18 hole stableford. There will also be a 9 hole stableford for gents. On Wednesday there will be a mixed scotch foursomes competition. The handicap is half of the combined total. Thursday is Men’s Day with an 18 hole competition to be played in strokeplay format. A 9 hole stableford for ladies will also take place. On Friday there will be a 9 hole stableford for both ladies and gents. The competition on Saturday is a Fourball Betterball and any combination is permitted. Each player will play off 9/10 of their handicap. The closing competition of Open Week will be an 18 hole Stroke for ladies and gents on Sunday. Full bar and catering facilities will be available each day. The Jack O’Sullivan team bowed out of the competition at the hands of Ballymote on Thursday last on a scoreline of 3 matches to 2. The Junior Cup team lead by Gary Carty will compete in the Junior Cup in Carrick on Shannon this upcoming weekend. It is a five man team played off scratch, and no player with a handicap of less than 5 in the previous year may compete. The team will attempt to qualify from Saturday’s strokeplay, for Sunday’s matchplay stage. In news related to this, the team captain managed to lead home a field of many of the competitors last Sunday in Carrick’s Junior Scatch Cup. Well done to other Boyle players – Brendan Gaffney, Sean Heslin & Charlie O’Donnell who also placed highly. The May/June draws took place in the clubhouse on Sunday evening. May results: Winner Pat Conroy €70, Runners up Claire/John Cryan & Ted Hestor €40 each. June Results: Winner Denis & Mary O’Donnell €70, Runners up Mary O’Hara & Michael Gilmartin €40 each. Congrats to all the winners and thank you for taking part. Good luck in the July draw. The final week of the kids ‘Get into Golf’ program will go ahead this Wednesday evening, with the two time slots remaining the same: 6-7pm & 8-9pm. Participants will receive their certificate of completion from the CGI on the evening along with a golf related goodie bag. A golf class for ladies & gents (beginners & improvers) will also take place from 7-8pm on Wednesday evening with PGA Professional Peter Duignan. Cost of the session is €8. Contact Gary on 0860682116 for more info.